If you've been following my blog or my social media accounts, you should know by now that I have recently revived my love for anime. My most recent anime obsession was Boku No Hero Academia (read my review on season 1 here); but every time I met up with my friends, I'd always complain about the lack of death and gore in that show. And while they've tried to explain why no one dies in BNHA, it never made any sense to me. I love my blood. I love my gore. And I love my deaths. They make me feel things. As such, you probably get why I completely and utterly fell in love with Castlevania when I started watching it. There's a lot to be said about Castlevania. Even before the anime came out, Castlevania has been a part of my life. I remember playing the video game as a child on my Gameboy Advance around the same time that I fell in love with Anne Rice's Vampire Chronicles. 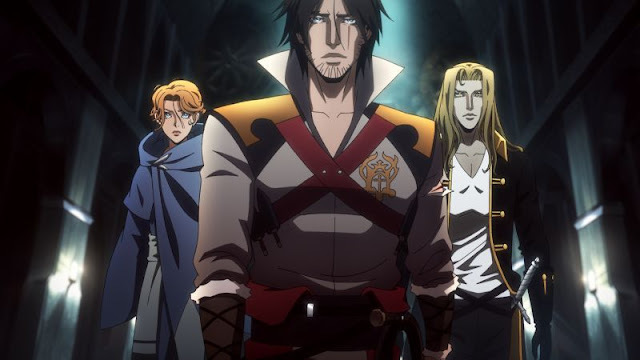 Well, Castlevania as an anime seems to have elements in it that feel like they could've been taken from Anne Rice's books while adding in the action and violence of the video games of its name at the same time. 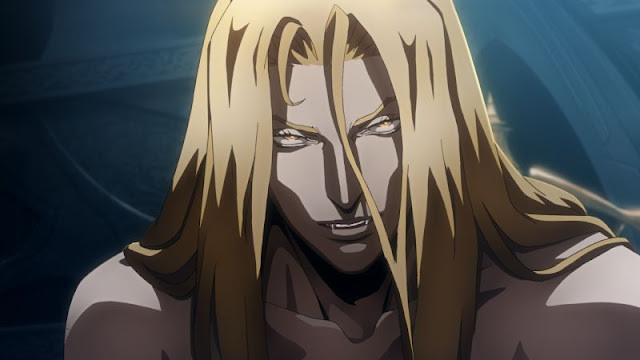 Doesn't Alucard remind you of Lestat? 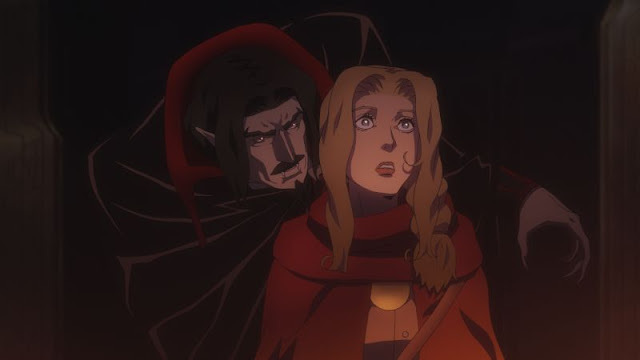 As for the plot of the anime, without giving too much away: Vlad Dracula Tepes basically unleashes a bunch of demons on Wallachia; and Trevor Belmont, Sypha Belnades, and Alucard come together to try and kill Dracula in order to restore peace to Wallachia. When I first started watching this series, I thought I wouldn't like it. 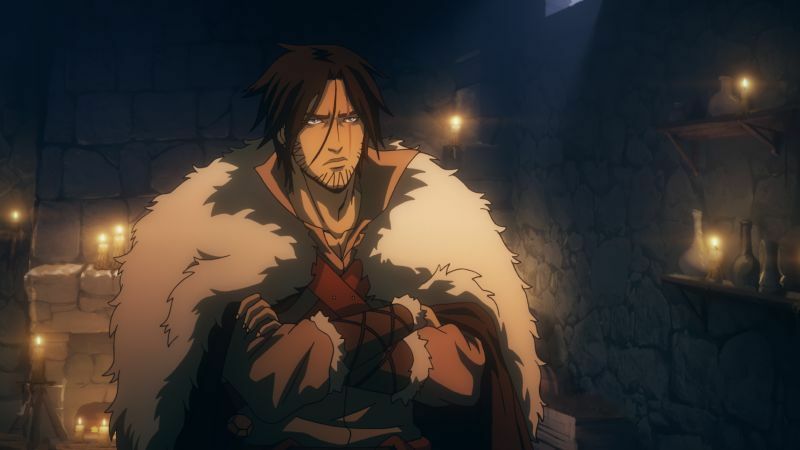 Having come off the BNHA kind of animation, the Castlevania animation took some getting used to. However, with such a gripping storyline within the first episode alone, it became absolutely impossible to stop watching. (Yes, I finished the first season in one sitting.) I was actually super surprised by how invested I ended up being within the first few minutes of the first episode. I found myself rooting for Dracula and hating the church with a passion. I also feel the need to point out that Trevor Belmont is voiced by Richard Armitage (you might know him from 'The Hobbit'). Just listening to him talk in itself makes watching the anime well worth it. Another great thing about this show is that you don't even need to be a fan of the video games in order to enjoy it. It has something for everyone - everyone but the kids, that is. It goes without saying that this anime is 100% for adults and not for children. The blood, the subjects, the swearing, and the jokes are all something that kids should not be a part of just yet. Also take note that it sometimes touches on religion; so if you're the über crazy, don't-mock-my-religion type, it might not be for you. Also take note that there are some dirty jokes and anecdotes, and some swearing in this show, too - no goody-goodies allowed. Generally speaking, Hollywood hasn't really been doing a good job at adapting video games to film or TV, so this is a very pleasant surprise. It looks like there is definitely some hope left in this genre. In fact, the only complaint I have is that the first season was far too short with only four episodes. I'll definitely be binge-watching the second season on Netflix when it comes out on October 26, 2018! You may watch 'Castlevania' Season 1 on Netflix here.